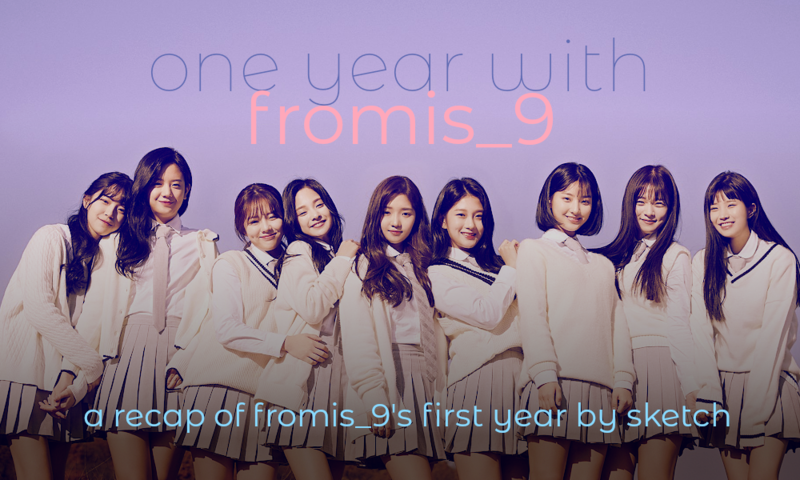 As fromis_9 celebrate their first full year as a debuted group, I’ve decided to take a look back at their achievements from the very start until now, as someone who’s followed them through all of it. Sit back and enjoy the #HAPPYfromis_9DAY party with me! The final episode of Idol School aired on this day, marking the formation and the beginning of fromis_. The nine members were revealed to be Roh Jisun, Song Hayoung, Lee Saerom, Lee Chaeyoung, Lee Nagyung, Park Jiwon, Lee Seoyeon, Baek Jiheon, and Jang Gyuri. The name ‘fromis_’ was revealed to be both an initialism for “from Idol School”, and a homonym (in Korean) for “promise’. For me personally, I cried so hard on this day. I wanted Jiwon to debut so badly that I even tried to send in a text vote for her, knowing that it only accepted Korean phone numbers. In my opinion, Idol School ended with the most perfect lineup one could wish for. Bonus fact – this was also Hayoung~s 21st birthday! fromis_ debuted their very own reality show, fromis’s room, on Mnet. The program followed them through moving into dorms together, training for debut, and various team-building activities. In addition to television broadcasts, the show was paired with Facebook live streams of the girls in the practice room. On centre Jisun’s birthday, Stone Music announced that a ‘9’ would be added to the group name, thus becoming fromis_9, to signify the 9 girls coming together. fromis_9 held their first official performance as a group, performing their pre-debut single Glass Shoes at MAMA 2017 in Japan. They also participated in the special stages of Pick Me, Heavy Rotation, and Koisuru Fortune Cookie with AKB48, Chung Ha, Weki Meki, Pristin, and the Idol School Class 1 girls. They gained attention for performing at an award show as big as MAMA even before making their debut, which certainly doesn’t happen very often. Glass Shoes was officially released, with its album being titled ‘fromis_9 Predebut Single’. Glass Shoes is my personal favourite song of theirs, even to this day. The EP ‘To. Heart’ was released with the concept of love letters, marking fromis_9’s official debut. The album contains three new songs — spoken intro The Way To Me, title track To Heart, and Be With You. It also features two songs from the finals of Idol School, Miracle and Pinocchio, as well as a new version of Glass Shoes, which adds the intro from the MV and the MAMA performance. Miracle was named as one of the best K-pop songs of 2018 by OH! Press. fromis_9 received their first award, winning New Star Award (Singer) at the 2018 Asia Model Awards. Gyuri was revealed as a contestant on Idol School’s sister program, Produce 48. She announced that she was participating as she had no formal training before debut, and wanted to improve before returning to fromis. Although controversial as she had just debuted, her participation gained Gyuri a lot of new fans, many of whom became fans of fromis through the show. The EP ‘To. Day’ was released, with no participation from Gyuri. The album and music video for title track DKDK followed the concept of cats — chasing cats, playing with cats, being surrounded by cats, and at some points, even being cats. All 6 tracks on the album were brand new. In my opinion, the best way to really get the feeling of DKDK is to watch their M2 Relay Dance and their M!Countdown comeback stage. Gyuri was eliminated from Produce 48 in its 11th episode, finishing in 25th place. This marked her return to fromis, and fromis becoming 9 once again. A new label named Off The Record was announced, with fromis_9 and Produce 48’s winning group IZ*ONE as its first artists. The special single album From.9 was released with a concept of explosions. This album features the title track Love Bomb, along with two unit songs — Dancing Queen by Saerom, Gyuri, Jisun, Chaeyoung, and Jiheon, as well as Colored by Hayoung, Jiwon, Seoyeon, and Nagyung, with Seoyeon writing its lyrics. From.9’s physical release also contains new versions of ‘To. Day’ tracks, DKDK and 22Century Girl, featuring all 9 members, both with the subtitle “From.9 ver”. Love Bomb has become their most successful song to date, reaching 10 million YouTube views, becoming an instant fan-favourite both among the fromily and other girl group fans, and gaining fromis loads of attention and new fans. It was also named as one of the best K-pop songs of 2018 by OH! Press. Welcome to Heal Inn, a web-drama starring fromis_9, premiered on VLive. Gyuri didn’t appear however, since the program was filmed while she was participating in Produce 48.
fromis_9 received their second award, receiving Asia Artist Awards’ Rising Award (Music), alongside boy group SF9. Being a fan of both groups, this had me really excited, even proclaiming #FROMISF91STWIN on Twitter. fromis_9 have had an incredible first year, and there is no doubt their years ahead will be even better. Here’s to a long and fulfilling career, both to fromis and the fromily!